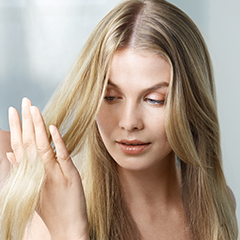 Defy hair loss by regrowing more hair with ROGAINE® — the #1 dermatologist recommended brand for thinning hair. It's the only hair regrowth treatment clinically proven to regrow up to 25% more hair in 3 months*, and your satisfaction is guaranteed. Never be without the product you need! Sign up for a ROGAINE® product subscription today to save money and time. Just order once, and you're done! Cancel anytime. ROGAINE® is the 1st and only FDA-approved topical product proven to regrow hair. Don’t just take our word for it...see how ROGAINE® has helped others grow back thicker, fuller hair. "I was amazed. I thought this product was only for men!! Don't be fooled ladies!" "I'm amazed, honestly... I've only used this for 2 months and I'm shocked, my hair line looks so much better!" "My hair grew thicker where it was thin. It really worked."